Cosy and very comfortable, 5 mins walk from Ocean or Surf Beaches and 15 minutes walk to town.On quiet fully fenced and private rear section. Room outside to play and lie in the sun. 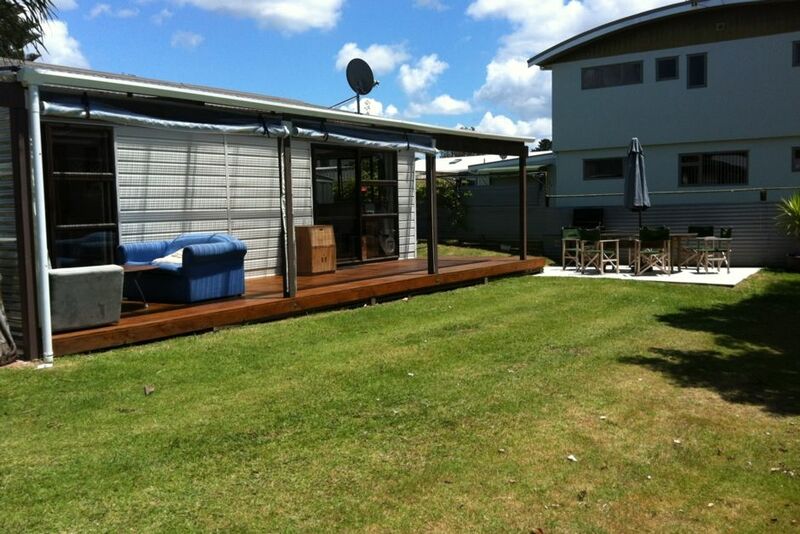 Large 9M x 2.5 Metre Deck. Main bedroom has queen size bed, the other has two new king singles.There is also a sofa bed now on the deck. Have added outside Shower ( yes Hot and cold for us softies) and also Sky dish. Feel free to bring your decoder with you. However , we do have two freeview decoders installed (one in lounge and one in the Bedroom) that give all the available channels other than Sky. Roll-down cafe blinds now give full protection on the deck if the weather turns bad. Check out 11.00 am and Check In 2.00 pm unless arranged prior,. This allows time for cleaning in between tenants. 2 Night Minimum stay but will vary at peak times.Animals OK but not on beds or furniture. Behavior that results in deliberate damage will be billed for accordingly and will be pursued legally if necessary. Deposit of 25% when booking, with balance due 2 weeks prior to occupancy off peak, or 4 weeks prior (peak). Deposit forfeit if cancelled within 2 weeks of occupancy. A bond may apply at our discretion,especially new Renters. By confirming your booking you agree to these terms and conditions. Opt in or out of the Williamson Park hustle and bustle, just a few minutes away. Clean & tidy with everything required. driveway is a very tight squeeze for a full size vehicle. fully fenced (low fencing) was great for our dogs. neighbors were friendly. Quite street close to beach. It’s a lovely, well appointed home with everything you need for a relaxing beach holiday. We enjoyed our stay very much. This property is in close proximity to both the surf beach and estuary. It has a good outside area with plenty of outdoor furniture and a secure fenced garden to keep kids and our small dog safe. Would recommend. Great little place to stay, dog friendly which helps. Neat and tidy. Good location. Superb bach, has everything you need with a wonderful outdoor area, deck and BBQ. Simon and Tina are excellent hosts and always attentive and quick to respond -- thank you. Thanks for using our bach and looking after it, pleasure to have you stay. Fantastic Bach. Wonderful outdoor space. Kitchen and living area spacious and beds super comfortable. Would definitely stay here again.